With the witty, forthright voice that has endeared her to her colleagues and peers for more than forty years, Grace now creatively directs the listener through the storied narrative of her life so far. Evoking the time when models had to tote their own bags and props to shoots, Grace describes her early career as a model, working with such world-class photographers as David Bailey and Norman Parkinson, before she stepped behind the camera to become a fashion editor at British Vogue in the late 1960s. Here she began creating the fantasy “travelogues” that would become her trademark. In 1988 she joined American Vogue, where her breathtakingly romantic and imaginative fashion features, a sampling of which appear in this book, have become instant classics. Grace will introduce listeners to the colorful designers, hairstylists, makeup artists, photographers, models, and celebrities with whom Grace has created her signature images. Grace reveals her private world with equal candor—the car accident that almost derailed her modeling career, her two marriages, the untimely death of her sister, Rosemary, her friendship with Harper’s Bazaar editor-in-chief Liz Tilberis, and her thirty-year romance with Didier Malige. Finally, Grace describes her abiding relationship with Anna Wintour, and the evolving mastery by which she has come to define the height of fashion. Includes a bonus PDF of photos from the book. Visit the Random House website HERE to listen to an audio clip of GRACE. She practically stole the 2009 documentary "The September Issue" out from under Anna Wintour, and at long last we'll hear the full story of how Grace Coddington went from model to editor. 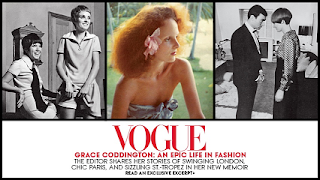 The new issue of Vogue has an excerpt from Coddington's forth-coming biography where the Vogue creative director writes about her days as a swinging London model. Let the salivating begin. The book arrives in stores on Nov. 20. GRACE! What a delight is this memoir of Grace Coddington. I think it’s great fun to escape to a world I’ll never know…that of the fashionistas and elite glamour moguls. 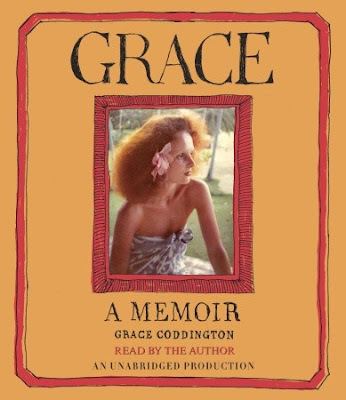 GRACE tells how there is no such thing as an over-night success showing how Grace Coddington made her way from a young girl riding her bike along the sea shore of Anglesey, a small Welsh village, to the high fashion salons of London and beyond. Her natural beauty was what the photographers wanted and the cameras loved. Grace’s fame grew and she led a fast paced life and career but it almost, however, came to an end after a terrible car accident. For a while, people were not sure that Grace would model again but with her ingenuity and perseverance, she made things happen. She covered her scars cleverly with different kinds of make-up and carried on. In between, her time off was one the tabloids would love as we read of her time spent with gorgeous men and on fabulous trips. But even these things must come to an end at some point as the story explains. When Grace realized that age would soon limit her modeling life, she turned to her natural talent with fashion and worked to become a junior editor at one of her favorite magazines, Vogue. It was there that Grace really could feel she belonged. The work and all the excitement that goes with such a position is fun to read about. She became a calm but stern taskmaster and in working with the infamous Anna Wintour, Vogue’s Editor-in-Chief, it came in handy. Although the two often disagree in the workplace, they both have great respect for each other and I found this part of the story fascinating since I have read much about Anna Wintour before. GRACE contains the honest opinion of its namesake on fashion and those who make up that glamorous world. She doesn’t shy away from telling it like it is and also has no time for people who don’t take their work seriously. The book itself is filled with gorgeous photographs and drawings, some by Grace Coddington herself. I, however, found the audio book just as tantalizing to listen to rather than to just enjoy the pictures. This would make a wonderful holiday gift for those who love fashion or interesting memoirs. It sounds like she has had a very interesting life. I would like to read the book. I think it is interesting that she has scars from a car accident and that doesn't keep her from being a model. I love that Grace has worked her whole life in fashion, transitioning from the front of the camera to the brains behind the image. I was captivated by Grace in The September Issue --- especially, like you, her prickly relationship with Anna Wintour. I'd love to know more! The relationship between her and Anna Wintour sounds interesting not to mention the 3 different relationships in her life.